This system lets you cook, boil, and generate power by means of a smokeless furnace. Going off the grid always got them fired up. This integrated generator system lets you cook, boil, and charge, all using the power of a compact, smokeless furnace. 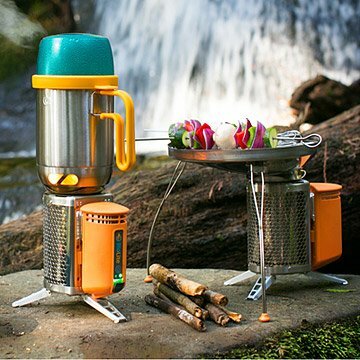 The kit includes a lightweight, portable grill and "KettlePot" attachments, plus a built-in charger that can power your smartphone or other USB-chargeable devices by converting heat into electricity. It also includes a flexible USB light which illuminates the grill and surroundings. This space-saving, comprehensive camp kitchen runs on renewable biomass such as twigs, pine cones, and wood pellets. Made in China. This recently upgraded design features 50% more power, an integrated battery, and an updated LED dashboard for improved control. Click here to learn about the features of your Portable Camp Grill and Charger and here for a explanation of how it charges your devices. We tested this product, but did it keep our tummies full? Find out on our blog.